just to keep it warm. 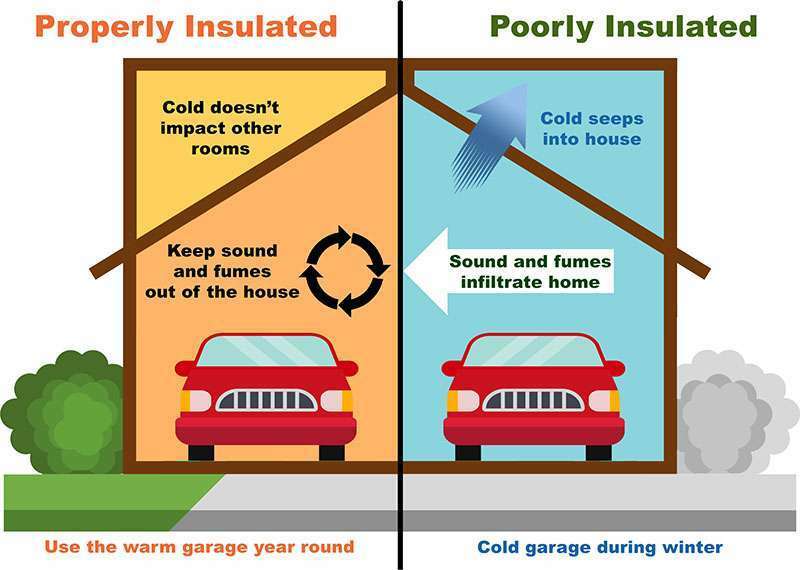 By insulating your garage you will be protecting your pipes from freezing in the winter. Garage’s are also frequently below other rooms in the house, and if the garage is not insulated then the room above will be colder due to the floor exposure. Winters in New England get very cold, and if you have a garage you have experienced going from the warmth of your home to the freezing cold of the garage. Save time in the morning by getting into a car that is warm and ready to be driven. If you have a workshop in the garage you know how noisy it can get in the house, and for your neighbors. Insulation acts as a sound barrier so that whatever work you are doing in the garage doesn’t annoy everyone around you. It also helps to keep CO fumes out of the house. To find out what type of insulation is best for your home. Schedule a FREE No Obligation Garage Estimate Today! Insulating your garage not only aids in keeping any heat in during the wintertime and hot temps out in the summertime, it aids in keeping those four – or eight legged creatures out of your personal space. Cellulose is a loose-fill insulation that is growing in popularity. Made primarily from recycled newspapers and treated with a fire retardant, cellulose is usually blown into wall and ceiling cavities with a special blowing machine. Blowers can be rented at many tool rental stores, and home centers will sometimes loan you a free one if you buy your cellulose from them. Because it’s loose-fill, cellulose is suitable only for finished garage walls and ceilings. If the garage is already finished (but uninsulated), you can install cellulose by cutting strategic holes in the wall material, spraying the insulating into the cavities between framing members, then patching the holes. Rigid foam comes in 4 x 8-foot sheets and thicknesses of 1/2 inch to 4 inches. Rigid foam offers a high R-value per inch of thickness and can be cut to fit almost any space. It’s a good choice for thin walls and for insulating garage doors. If you’re turning the garage into living space or a full-time workspace and want to insulate the floor, one option is to use rigid foam covered in plywood or other subfloor material. Spray foam is the most used insulation application for garages. It’s excellent for both R-value and for air-sealing. As a high-end material typically used for energy-efficient construction, spray foam is efficient in regulating temps, keeping moisture and pests out as well as keeping out excessive noises from the environment around you. Don't forget to insulate the Garage Door! The fact that “heat rises” makes your attic one of the most important rooms to insulate in your home. Walls make up a lot of the house’s surface area, so it’s not too surprising that a house’s largest heat sink tend to be the walls. Not only is crawl space insulation important to keep you warm, but it is also important to keep your pipes from freezing. With the proper insulation not only can you keep out the cold, but also many insulation types can keep out pests such as mice, insects, as well as being mold resistant.